From the stagecoaches of the Great North Road to the Mallard and Flying Scotsman of the London & North Eastern Railway (LNER); from Britain's longest road tunnel and the world's first commercial jet aircraft, Hatfield has helped bring Britain and the world closer together. But progress has come at a price. Roman Roads – 'Roman Roads in Britain', Ivan D Margay, lists two roads that ran through Hatfield. One route was Cheshunt – Hatfield – Harpenden – Dunstable (23.5 miles / 37.8 km), and the other London (Cripplegate) – Hatfield – Stevenage (30 miles / 48.3 km). Great North Road Hatfield has historically been the first stop for coaches on the Great North Road from London. The road originally used to run in front of Hatfield House before going down Fore Street (but changed following the arrival of the railways). Having galloped all the way from London and then descended or facing a steep hill, it's not surprising that the horses needed a rest. Hatfield had a number of pubs, coach-houses and inns to cater for this trade. The Salisbury Arms (now a private residence) reputedly had a courtyard big enough for a hundred horses. Hatfield Rail Station – became part of the rail network in 1850 when the London to York railway was completed. The line was later extended all the way to Scotland and used by famous steam engines like the Mallard and Flying Scotsman. Hatfield later became a rail terminus and junction when branch lines connecting Dunstable, Hertford, Luton and St Albans were built. Later on, a steam shed and turntable were added, and Hatfield had four signalling boxes. Today, little remains of what was once a major station and yard – the grand station with its private waiting room was demolished. However, the offset platforms are still something of a novelty on Britain's railway network. AA Road Sign – The first AA road sign was reportedly erected in Hatfield in 1907. It had black lettering on a yellow background and gave distances to neighbouring towns around its outer edge. DH.106 Comet – produced by the de Havilland Aircraft Company at Hatfield. The world's first commercial jet airliner, it first flew from Hatfield in 1949. However, Sir Geoffrey de Havilland and his company were established pioneers in aerial transportation long before the move to Hatfield. Among their other passenger aircraft were the DH.84 Dragon, DH.86 Hercules, DH.89 Dragon Rapide, DH.90 Dragonfly, DH.91 Albatross and DH.95 Flamingo (all but the first two made their maiden flights from Hatfield). Hatfield Tunnel – part of the A1M Britain's first motorway, opened in 1986 as the longest tunnel in the British road network. The construction method used was cut and cover – basically excavate the site, build the tunnel and cover it up. Unfortunately, this led to the demolition of some historically important buildings like the de Havilland workers' flats and the Stone House Hotel. Hatfield Rail Disaster – 17 October 2000, an Great North Eastern Railway (GNER) InterCity 225, the 12:10 London to Leeds, derailed on the bend before Hatfield station killing 4 people and injuring 70. It was caused by a cracked rail breaking as the train passed over it. The crash had a massive impact on Britain's railway network and led to demise of Railtrack – the rail infrastructure company. It was replaced by Network Rail. 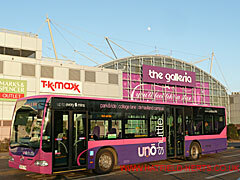 Uno – first called UniversityBus when it was established in 1992 by the University of Hertfordshire. It has since grown into the town's main bus company with a fleet of 50 buses. It established its own garage in 2003 and became Uno in 2005. Over the years the livery has changed – from the US-style school bus yellow to a mainly white scheme, which in turn was replaced by the current livery. Tornado – the first steam engine to be built in Britain for almost 50 years passed through Hatfield on its first outing to London. A Peppercorn A1 60163 locomotive, it took 19 years and £3 million to build. 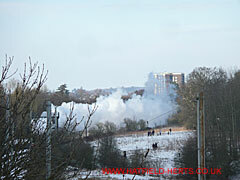 The photos shows Tornado passing through a snow-covered south Hatfield on her maiden run to London Kings Cross. Volvo FE Hybrid HGV – July 2010, Volvo Trucks and DHL unveiled what was billed as the 'world's first 18-tonne hybrid distribution truck' at DHL Supply Chain's Hatfield depot, where it is operating on a two year trial. Powered by electric motor (with regenerative braking) and diesel engine, its 'teardrop' body is built by Don-Bur.